We are extremely fortunate at Faith Primary School to have the In Harmony programme. Harmony is inspired by Venezuela’s El Sistema, and uses the power of orchestral music- making and the ethos and shared values of an orchestra to improve the health and wellbeing of young people, their families, and their wider community. In Harmony Liverpool is managed by Royal Liverpool Philharmonic, and has been working in our school in Everton since 2009. Every single child at Faith, from Nursery to Year 6 have weekly sessions, lessons and ensemble rehearsals with Liverpool Philharmonic musicians. 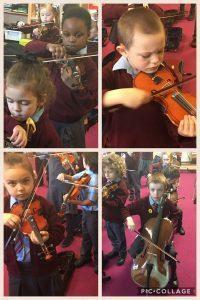 All children from Y2 upwards learn an instrument and have a weekly orchestral rehearsal. 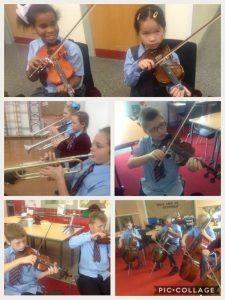 Children from Y1 – Y4 learn a string instrument. 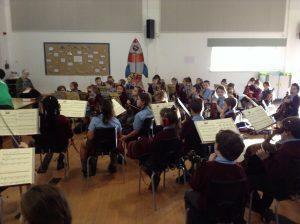 Children in Y4 – Y6 can opt to learn a brass, woodwind or percussion instrument. Some of the staff at our school learn an instrument alongside the children. In Harmony Liverpool is now working with over 700 children and young people from the Everton Community, across three sites (Everton Nursery School & Family Centre, The Beacon and Faith Primary School).